With a political system engineered to kneel at the altar of cash, Reagan Outdoor Advertising—Utah's largest owner of billboards—has pushed its political agenda by slinging currency at hundreds of political candidates at all levels of government. Since 2008, Reagan has given $548,000 in campaign contributions to fleets of Republicans and Democrats alike. During this same time, many laws pertaining to the outdoor-advertising industry have been tailored in a manner that many consider favorable to the industry. But in the aftermath of the 2010 Citizens United ruling, in which the U.S. Supreme Court decided that corporations should be afforded the same First Amendment rights to free speech as people, Reagan has shifted into a new realm of political kingmaking by forming a Super Political Action Committee (PAC), Utahns for Independent Government. During the past week, billboards have begun popping up across Salt Lake City promoting the mayoral campaigns of Jackie Biskupski, Luke Garrott, George Chapman and Dave Robinson—everyone running for Salt Lake City mayor except incumbent Ralph Becker, who is seeking a third term in office. Using a PAC to support Salt Lake City municipal candidates allows donors to circumvent some campaign-finance laws and is unprecedented in local politics, says Matthew Burbank, an associate professor of political science at the University of Utah. "What's interesting is that this is the first time that I'm aware of that we've seen this type of independent expenditure," Burbank says. "This is a case where they're not giving money to the campaign; they're spending it independently." Garrott—who has asked Reagan to take down his billboards—and Becker both say the involvement of a PAC in the city's election is troubling on several fronts. Chief among them, they say, is the apparent ability of the organization to skirt a city ordinance that caps campaign contributions from individuals and corporations at $7,500. Evidence that this campaign contribution limit is being exceeded is clear in the campaigns of Biskupski and Garrott, both of whom received in-kind contributions—at or near this $7,500 limit. Yet, each is now plastered on billboards, the value for which would undoubtedly put both candidates over the city's donation cap. "While there is a provision for PACs in the city campaign system, as far as I know, they have never been used, and we certainly haven't seen a PAC like this set up that just so clearly circumvents and evades the intention of our city campaign-finance system," Becker says. In its vast history of contributing to campaigns, one mouth has remained conspicuously absent from the Reagan feeding trough: that of Ralph Becker. Since his time on the Salt Lake Planning Commission in the 1980s, Becker has spearheaded efforts to beat back the pervasive presence of billboards—and the companies behind them—in the city. Decades ago, Becker remembers drawing the ire of Reagan when he helped see to it that the city passed an ordinance to make it more difficult for new billboards to pop up in the city, and easier to prevent them from reappearing once they were removed. And during his 11 years in the Legislature, Becker says he was flummoxed as he watched his colleagues pass law after law that further protected Reagan and the billboard industry. "It is the most protectionist piece of legislation for an individual business, or this type of business, of anything I'm aware of in Utah law," Becker says of state laws involving the outdoor-advertising industry. Becker may be one of the only long-serving politicians in the nation to eschew billboards altogether. He doesn't hide his distaste for billboards, but also recognizes them as a "legitimate" form of advertising. "Make no mistake about it: I think they degrade, they serve as visual pollution in a city like ours with beautiful scenery, and they mar the landscape," Becker says, noting that he has never used a billboard in any of his campaigns. Talk like this has prompted Reagan to put its muscle behind not just one, but all of the other mayoral candidates. Nate Sechrest, general counsel for Reagan and secretary of the company's PAC, says that the PAC and its many supporters—who will be publicly known in August when the entity discloses who bankrolled the effort—believe Salt Lake City needs a new mayor. Sechrest conceded this is Reagan's first foray into the world of unfettered campaign support by a PAC, and that the business climate in Salt Lake City warranted it. "The answer is simply that the administration's been so aggressively bad for business in Salt Lake City," Sechrest says. "We actually, and quite a few like-minded organizations, have decided that enough is enough, and we need to see some change down at city hall." That politicians fund their campaigns with money is no surprise, and Becker is hardly new to the game. Using money as a marker of success in a political campaign, Becker is beating the snot out of his opponents. So far, he's raised $419,495 to Biskupski's $219,824. Meanwhile, Garrott has brought in $17,906. And Becker does not shy away from corporate donors. Cowboy Partners LC, a local development firm with projects sprouting across the city, contributed $5,000. Another construction outfit, Northstar Builders, also has given $5,000, while Becker has received $5,000 from HDR Inc., a construction, architecture and engineering firm in Omaha, Neb. ; and $3,000 from Simon & Company, a Washington, D.C., firm that lobbies on behalf of local governments. On the reality that successful political campaigns require money, Becker says that when he began seeking political office decades ago, he told himself he'd have to live with it. Nevertheless, he says the role of corporations and the amounts they should be allowed to contribute is worth discussing, and potentially even changing. Although he believes Salt Lake City's $7,500 cap serves to silence the outsize influence that individual or corporate donors can have, he would consider lowering it. "For better or worse, it costs a lot of money to run an effective campaign," Becker says. "I believe in playing by the rules and playing by the intention of the rules and being open and transparent about it, disclosing where our contributions come from and what they're used for and letting the public make decisions." Garrott, the current Salt Lake City Council chair, has had his eye on limiting campaign contributions from Day 1 of his mayoral run. He placed a $1,000 limit on the contributions he received, and says that, this summer, the council will consider dropping the city's $7,500 cap even further. His interest in limiting money's influence in politics made it all the more insulting when he discovered billboards had been erected showcasing his broad smile with the words: "Luke Garrott Salt Lake City Mayor." But even Garrott plays ball with Reagan. He received $7,500 of in-kind contributions—free billboard space—from the company. However, Garrott says he made it clear to Reagan that he didn't want any assistance above and beyond the city's contribution cap. "The people have set, through the city code, those limits that I'm trying very hard to respect," Garrott says. "You can't help but ironically laugh at the Reagan billboard PAC not caring." While Garrott has demanded that the billboard signage erected in his honor be removed, and Becker has called on Biskupski to do the same, Biskupski seems OK to ride out the storm with her face splashed, without her consent, across the city. 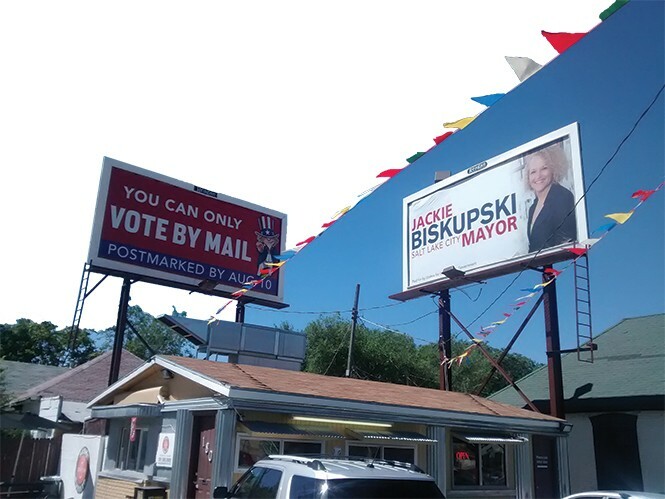 "If these billboards are causing people to pay attention to PACs and the rules that govern them, I think that is a good thing," Biskupski said in a written statement. "Unlike municipal campaigns, neither the Legislature nor state PACs have any donation limits. I believe it makes sense to limit contributions to candidates and PACs—unfortunately, that rests in the hands of the Legislature, and the majority has not shown an appetite for making that change." As a PAC, Sechrest says Utahns for Independent Government doesn't have to listen to any of the candidates. In fact, to ensure it doesn't run afoul of election laws, the PAC cannot listen to the candidates. That means that if Garrott wants his billboard taken down, he'll have to take it down himself—though he fears Reagan could have him arrested for vandalism or trespassing. "I'm not sure that we would be inclined to risk any kind of correlation between what he asks us to do and what we actually do," Sechrest says of Garrott. "We're not coordinating in any way, shape or form."